After nearly two decades of flying traditional piston aircraft, John Gressett had grown tired. “There was nothing new and enthralling about aviation. The planes I had been flying were too much work to really enjoy,” explained John. He was on the brink of losing his excitement and passion for aviation, until the Southeastern Minnesota Flying Club retired their 1974 Cessna and purchased a 2005 SR22 GTS. John was not entirely keen on getting a fully loaded Cirrus, but now, he couldn’t be happier with the Club’s decision. “The autopilot and instrumentation is a huge differentiator from other aircraft. You can tell the difference just by sitting in the pilot’s seat. I know the difference between driving a sports car and riding a unicycle, and I would much rather drive the sports car,” chuckled John, talking about the incredible advantage their Cirrus gives them. John was given the gift of a new start. Realizing how much fun flying a Cirrus was compared to other aircraft, he found his love for aviation again. 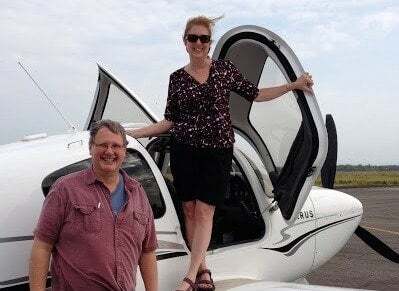 As a recently retired IBM Executive, John has been making good use of his new found freedom by crossing off adventures from his bucket list with his Cirrus. In February 2014, he got his real taste for adventure after flying from Minnesota to Costa Rica and back. “Buying this plane in itself was fulfilling the dream. In this case, it’s like – WOW – who would have ever thought I would fly my plane to Costa Rica?” John remarked. He was scared to death to fly out of US controlled airspace, but John’s confidence in his Cirrus’ ability never faltered when flying over open water. “When we jumped off Key West we were terrified, and when we landed in Costa Rica my wife and I were surprised at how easy the trip actually was,” John said. “The flight would have been brutal in anything other than our Cirrus. The SR22 opened up so many opportunities for us that we wouldn’t’ be able to do any other way.” John and his wife took the trip to Costa Rica again in February 2015 after deciding they couldn’t get enough. He’s taking full advantage of the Cirrus Life, and there is even more adventure in store for John in the future. He’s planning on doing a similar international trip, but this time heading northwards to Churchill, Manitoba. “Sightseeing and whale watching will be a great new adventure,” said John. “Only in a Cirrus is traveling internationally possible, fun and comfortable.” His Cirrus has made him an adventure flying enthusiast, and John’s current ambition is to teach Cirrus owners how easy flying their own planes internationally can be. He intends on seeing the world in his Cirrus, and the more John flies, the longer his bucket list gets. He’s adding new destinations every day! Check out his personal website at: http://www.johngressett.com.